Singaporeans First (SingFirst), one of the newest political parties, has hit out again at what it calls the Government's "liberal immigration policies" in the past decade. 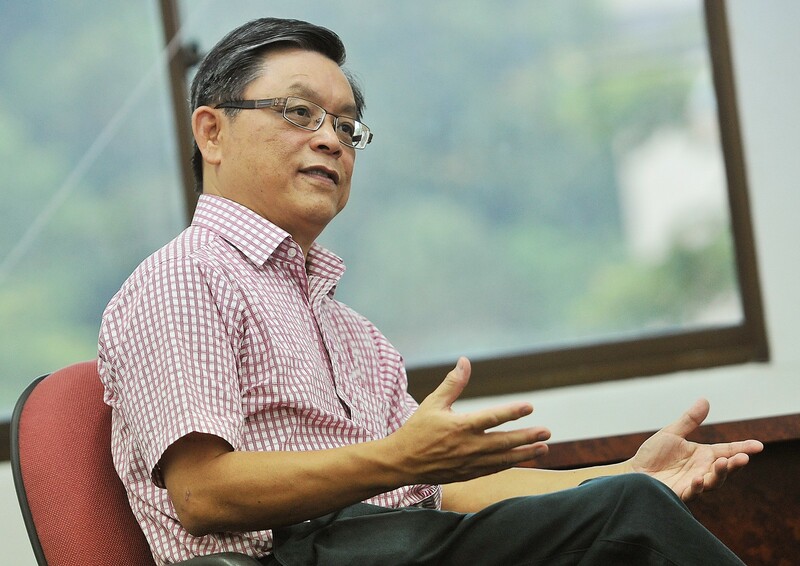 "I'm afraid in the last 10 years, things have gotten worse with the influx of foreign workers," said chairman Ang Yong Guan. The 60-year-old psychiatrist was speaking at a press conference yesterday, where a second and final batch of candidates for the Sept 11 polls was introduced. Besides Dr Ang, the others introduced were chemist David Foo Ming Jin, 51, retired police officer Sukdeu Singh, 64, sales director Wong Soon Hong, 57, and retired army colonel Tan Peng Ann, 67. This brings to 10 the number of candidates the party will field. It will contest the Jurong and Tanjong Pagar GRCs but has not said who will stand where. Dr Foo said he is also concerned by the way Singapore's economic growth was achieved largely through "labour and capital". As a result, not only have incomes stagnated, but also "income splits" are no longer between average earners and the rich, but "between citizens and foreigners, private and state-owned companies... This is not a sustainable situation for any country to be in". Mr Tan said current policies on foreign labour need an overhaul, with a key change being the way Singaporeans view blue-collar jobs. "When I go to the hospital for a check-up, the nurses and doctors are foreigners. Why aren't locals doing these jobs?" he asked. If elected, candidates will push for a change in mindset towards blue-collar work, such as in construction, through education. Dr Ang said liberal immigration policies caused more Singaporeans to suffer from psychological problems, and related an incident where he said a local was passed over for a promotion that went to a foreigner instead: "He felt insecure as a Singaporean. He broke down, he couldn't eat, sleep and he had an anxiety attack... When we go into Parliament, we will fix it." SingFirst secretary-general Tan Jee Say said the influx of foreigners is "a very sad thing" and suggested that they did not integrate well. "My children watch night-time football and we order from McDonald's. The people who deliver it were our adik (younger brothers in Malay) and they will talk about their favourite football team," he said. "Now, the deliverymen are from China. They are not interested in football, only ping-pong. So how do we communicate?" SingFirst also said its $6 billion social safety net plan to help poor and middle-class Singaporeans - announced on Friday - would be funded by the Net Investment Returns Framework in the Constitution. The party will introduce monthly cash allowances of $300 for children and the elderly and subsidise healthcare, transport and childcare fees, but without raiding the reserves, said Dr Ang. This final group of five candidates has a wealth of experience, compared with the four introduced on Friday, who were aged between 36 and 48, he added. To attract younger members, the party will set up a youth wing, Young First, and engage younger Singaporeans via social media. 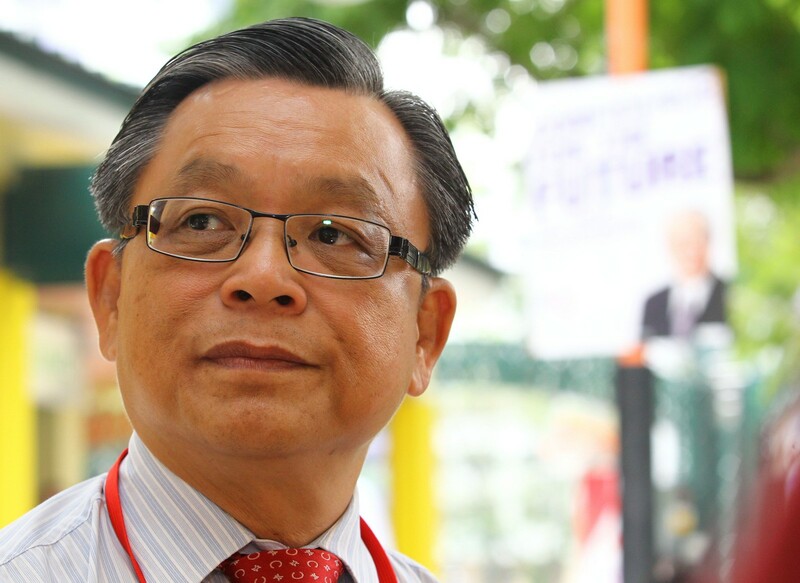 Dr Ang also addressed an error spotted by netizens in the party's Tamil tagline on a banner . "We embrace imperfection. At least we admitted it and we corrected it within hours," he said. I'm doing it for my grandchildren. I'm concerned about the short-sightedness of certain policies that have affected Singaporeans, particularly seniors. I've years of experience in community service, management and leadership positions. I studied in Raffles Institution and have a degree in Political Science and History. With this background, I can help Singaporeans better. The long-term impact of education and population policies, and issues seniors face. Home. It's time to take two steps back and do more meaningful reading. I want to speak up for the elderly. I have been participating in grassroots activities since young. I've been travelling in China, Vietnam and Malaysia over the past several years and I have noticed disparities between our political and social programmes compared with these countries. I feel that we have somewhat deteriorated, and I must do something about it. I am concerned with the rising cost of living and escalating home prices. 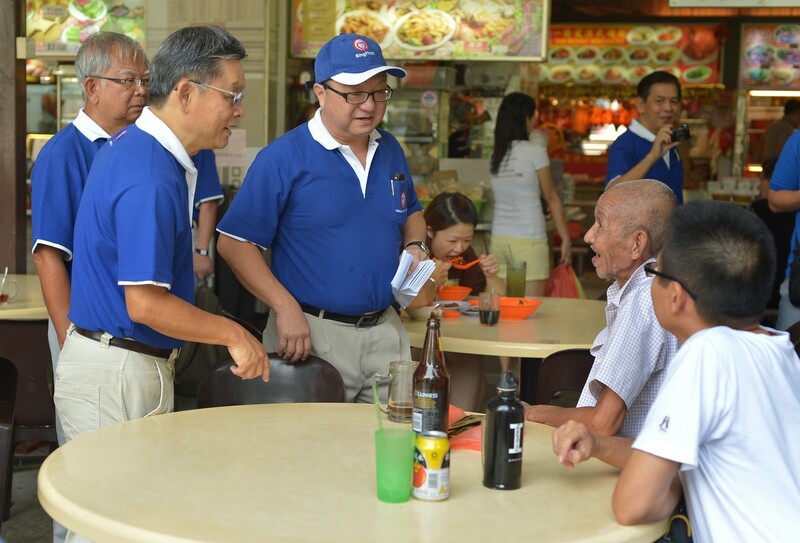 I will also focus on issues that senior citizens in Singapore face. Night Safari. I like the animal shows. I view politics as a sense of responsibility. I am greatly concerned that incomes have stagnated in the last 10 years. I've always been concerned about politics since secondary school. I often ask: "What if our government goes rogue? Do we have an alternative? "After so many years of asking these questions, I have decided to offer the alternative. Government transparency, issues faced by the middle class, issues of income inequality. East Coast Park. I live nearby and I go there to walk my dog. I am motivated by the British administration. I felt they had taken very good care of Singapore when we were its colony. I am grateful to them. They did a good job. I want to look after Singaporeans well, too. I came from a very difficult background. My dad became blind when we were still very young, and I received free textbooks when I was in school. I was also given milk to drink in school because I was weak. I'm concerned about poverty, about children who go to school hungry. I also want to help those who use wheelchairs and live in one-room flats. I love Changi Beach. Changi Village's old-world charm brings back memories. 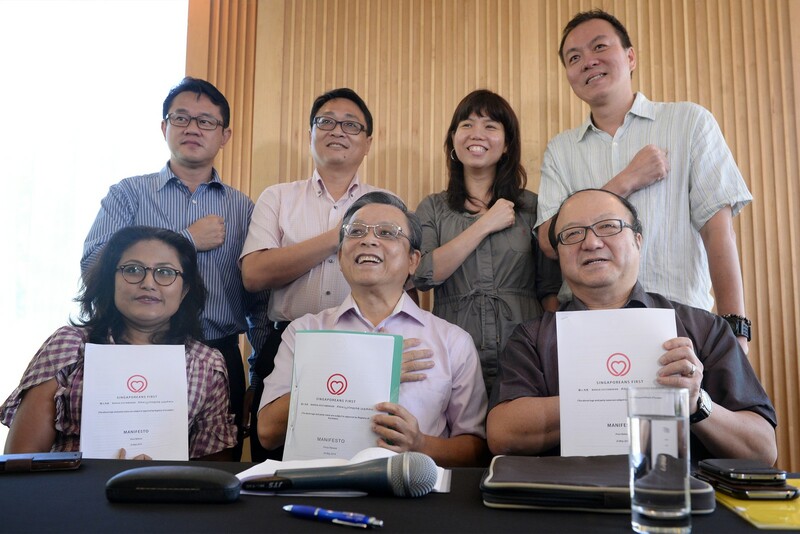 New local political party Singaporeans First founding members – (clockwise from top row) Fahmi Rais, a communications professional; Dr David Foo, a chemist and logistics professional; Jamie Lee, a project manager; Winston Lim, an architect and town planner; Dr Ang Yong Guan, a psychiatrist; Tan Jee Say, a financial advisor and former presidential candidate, and Fatimah Akhtar, an architect – with the party logo and name. 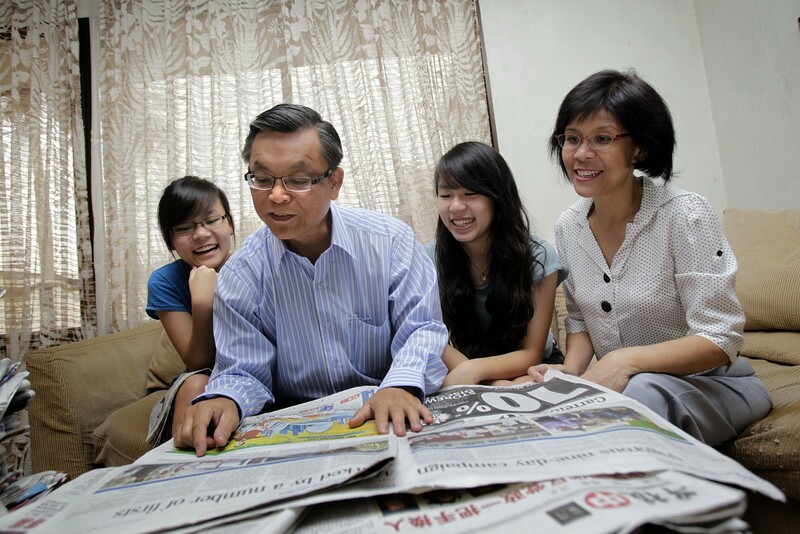 Presidential candidate Tan Jee Say reading the newspapers at home with (from left) his daughters Sarah and Anne and his wife Patricia on 26 August 2011. He spent the day at home in Frankel Avenue with his family, then met close friends for dinner. Former presidential candidate Tan Jee Say signing a copy of A Nation Awakes: Frontline Reflections, for student Kelly Wong, 13. 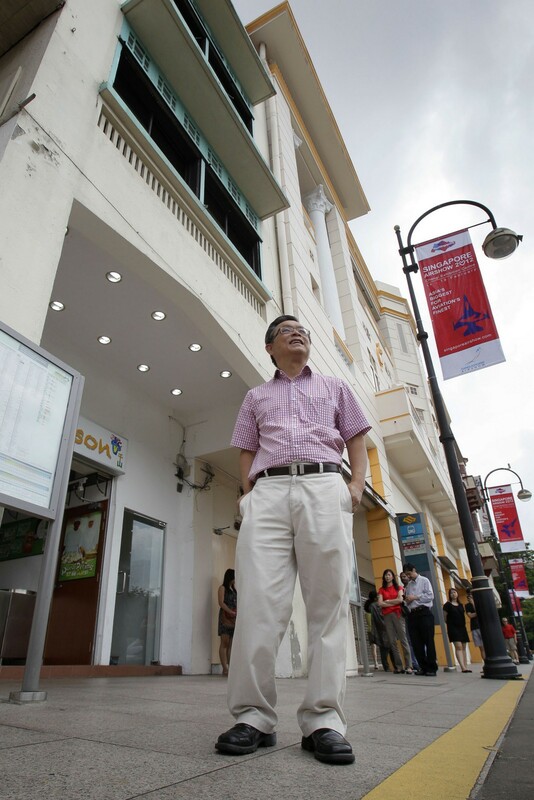 The 282-page book, launched at a yet-to-be-opened cafe near Dhoby Ghaut to the rousing beat of a lion dance, has personal accounts by 17 people, most of them members of the Singapore Democratic Party (SDP). 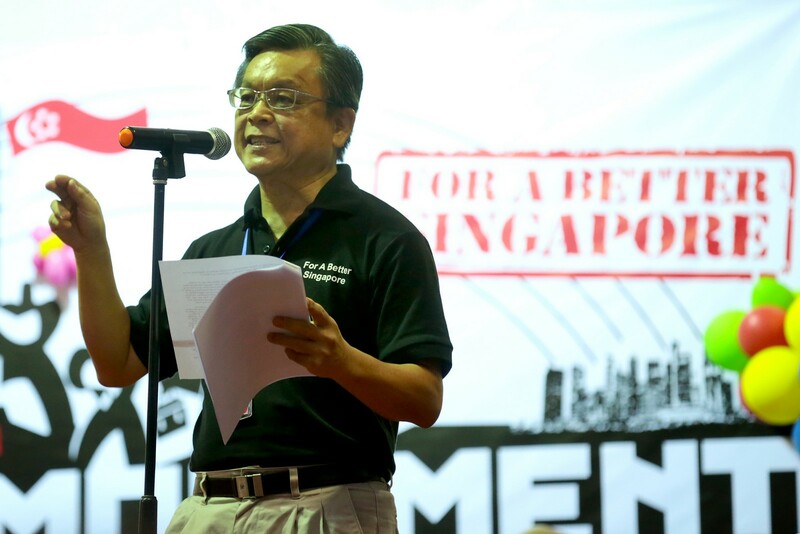 Former presidential candidate Tan Jee Say speaking at the Stand Up On May Day event. It was organised by the Stand Up For Singapore group at Hong Lim Park on 1 May 2013. 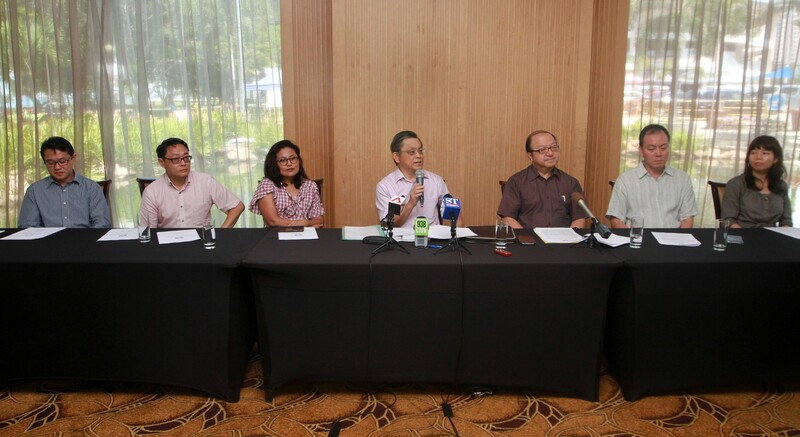 Some of the founding members of Singaporeans First, a new political party, at a press conference held on 25 May 2014. 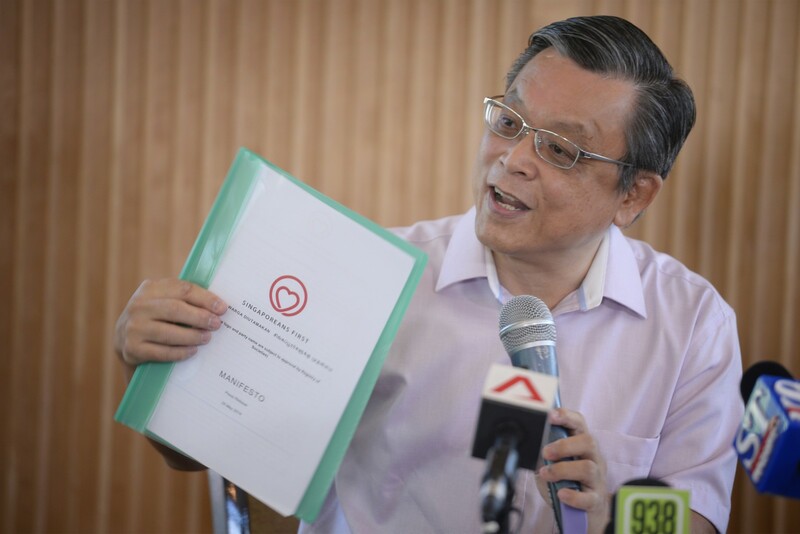 Former presidential and SDP candidate Tan Jee Say introduces the name and logo of his new political party, Singaporeans First, which he set up with 10 other members, during a press conference on 25 May 2014. 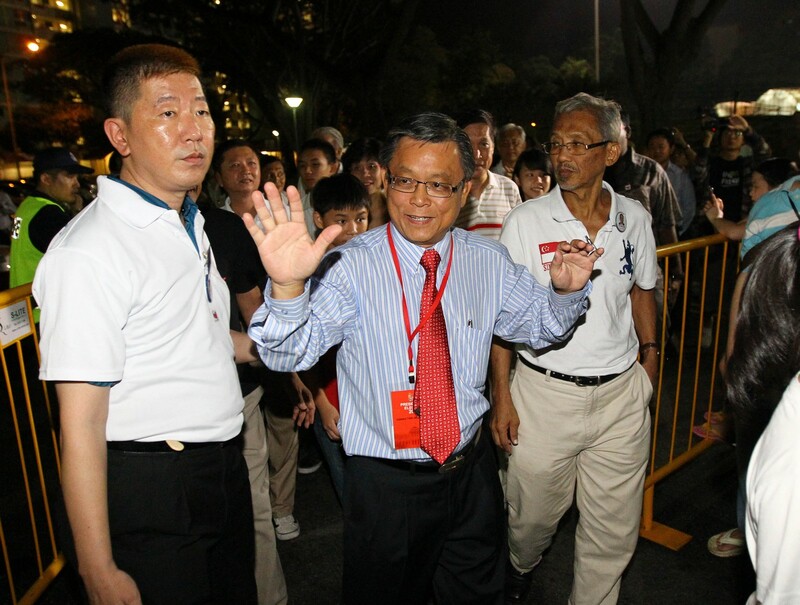 Mr Tan Jee Say (second from left) accompanied by his party members Mr Tan Peng Ann (left) and Dr Ang Yong Guan (with cap on) from the Singaporeans First Party (SingFirst), gave out leaflets during their first walkabout in Tanjong Pagar GRC, a stronghold of the ruling People's Action Party (PAP). They did their walkabout at Holland Drive Market and Food Centre.